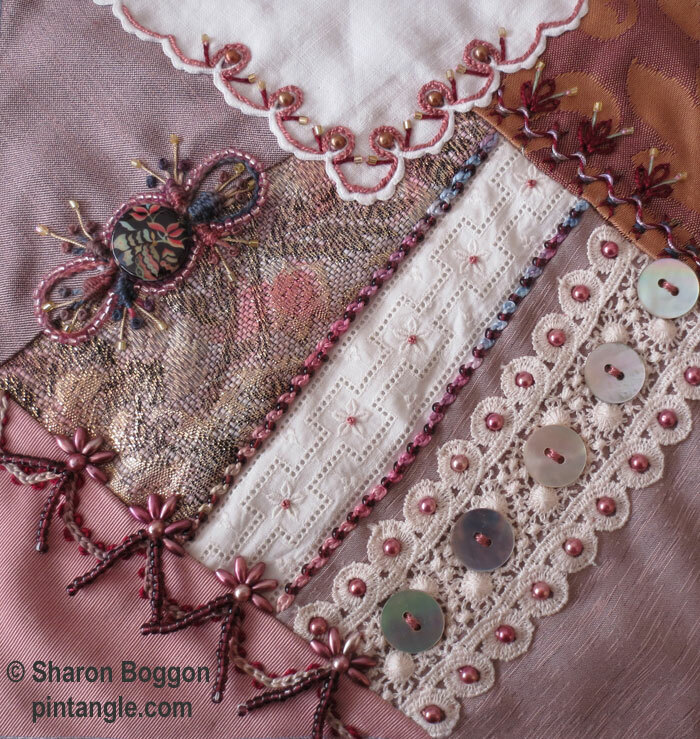 The last time I shared a work in progress report I had just started block 35 on my next crazy quilt. Last week I was franticly working to get my CQ Templates announced and out. I did not post a progress report because I had none! This week its a different story as I have completed the block! Click on the block to see a larger version and below I have a few details to share as I know readers like to get a bit of a sticky beak at what I have been doing. On this block I used a corner of a serviette. 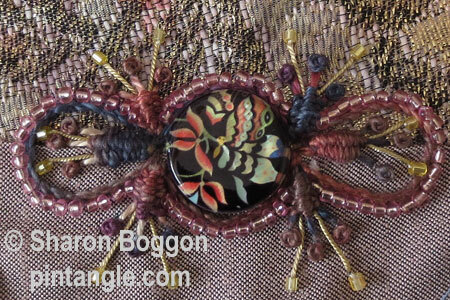 I picked out the details of the complex edge, in chain and stem stitch using a #8 perle cotton. I then added some straight stitches in #5 perle cotton and some beads. As you can see I used the stencils to produce this seam. On my stencils I have a hexagon shape. I traced off a series of half hexagons along the edge of a seam. 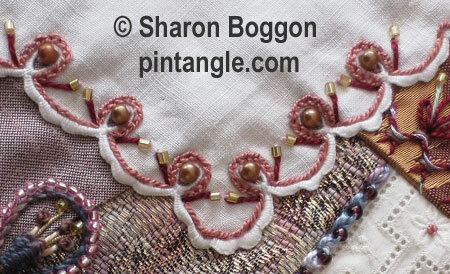 Then I embroidered the line in threaded chain stitch using #5 perle cotton. 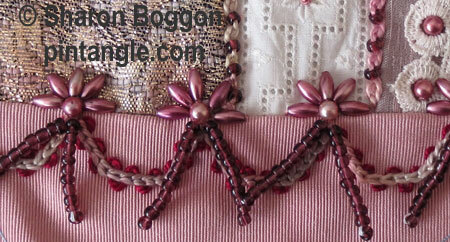 I added beads and little bead tassels as a final touch. It was a fun seam to work and relatively quick! This next detail is a pattern created from what I am calling an irregular scallop because I cant think of any other way to describe it! It is a shape found on the side of one of the stencils. Because the stencils are clear it is hard to photograph but I have traced a dotted line along the side I am talking about. I traced the first line then flipped the stencil, positioned it and then traced a second line. Since the stencil is totally clear lining the edge up is not hard as you can see straight through it. When you use this edge to trace off two lines and flip one of them a circle space is created between the two. I have designed the stencil so that this space will take a button that is approximately three quarters of an inch or about 2 centimetres in diameter. 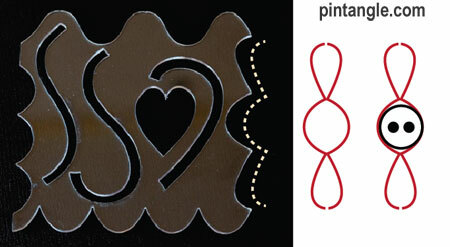 I designed the stencil this way, so I can fit a button or as in this case a wide disk shaped bead in that area. As you can see it works well, and once you have the shape started it is easy to add further decoration. Anyway I thought I would share! No new champagne blocks for me this week – but I did put finishing touches on 3 of my hexagon blocks and got the pictures posted. These blocks started with Sharon’s TIF a few years ago, then I made more for the CQ Journal Project last year and continued this year. I plan to finish this journal year with them – then decide if I need more. Such a gorgeous block. I like the pattern you created with your new stencil, it looks like a candy wrap. Good morning! You have proved how useful your stencils are in creating beauty. This block is full of lovely details.